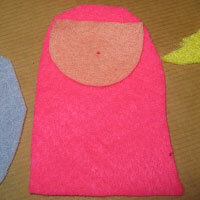 Cut out all the shapes from the template.  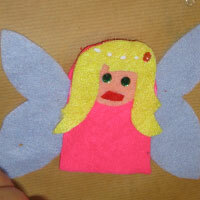 Templates are available through Winnie, or you could even make up and draw your own, it's not hard! 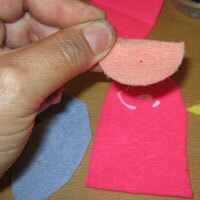 Once you've cut out your paper templates, you need to cut the shapes from the felt. 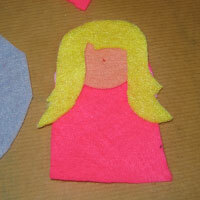 Pin the template to the right coloured felt and then just cut it out with a scissors. 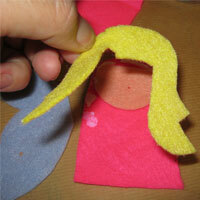 If you don't want to use pins, simply hold the template firmly in place on the felt. 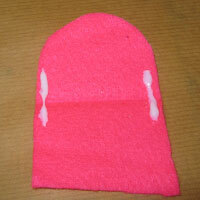 Take one of your pink body pieces, and, using your ice-cream stick, put some glue near the top. 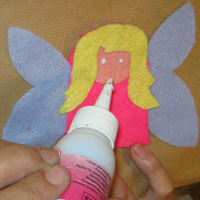 Take your peach coloured fairy face and gently press it onto the glue, sticking it into place. 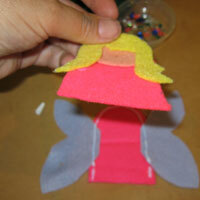 Place some glue around the fairy's face for the fairy's hair. 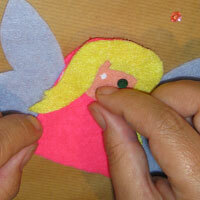 Gently stick the fairy's hair into place. 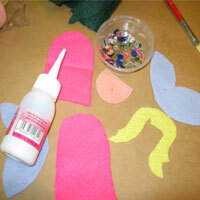 Take your other body piece, and place a line of glue on each side. 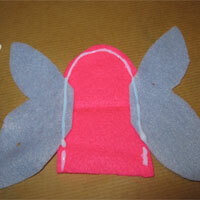 Gently press the fairy wings onto the glue, sticking them into place. 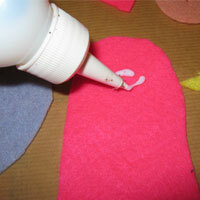 Place glue along the edges of your body piece. 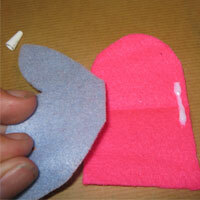 Make sure that you do not put glue on the bottom straight edge of the body piece of felt. 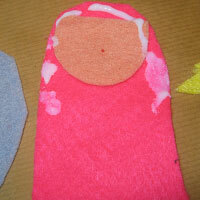 Place the other body piece on top of the one with the glue, and gently press to stick the two fairy body parts together. 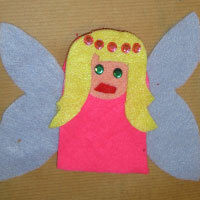 Place two dabs of glue on the fairy's face. 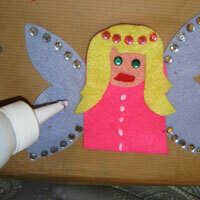 Place a sequin of each blob of glue to make the fairy's eyes. 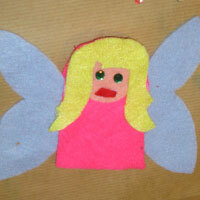 Glue the fairy's red felt mouth into place. 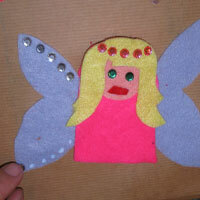 Place dots of glue near the top of the fairy's head, and stick sequins on to create the fairy's tiara. 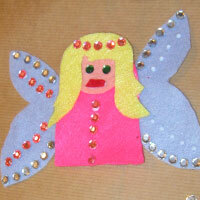 Place dabs of glue along the fairy's wings and stick sequins into place to decorate. 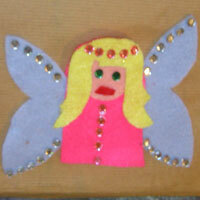 Place dabs of glue down the centre of your fairy and decorate with sequins. 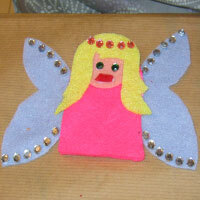 Continue gluing decorations onto the wings of the fairy. 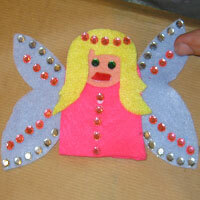 When you are happy with the decorations on your fairy fingerpuppet's wings, your fingerpuppet is complete.